18 1/4 by 23 in. Federico del Campo stands out as one of the few well-known 19th century Latin American painters. 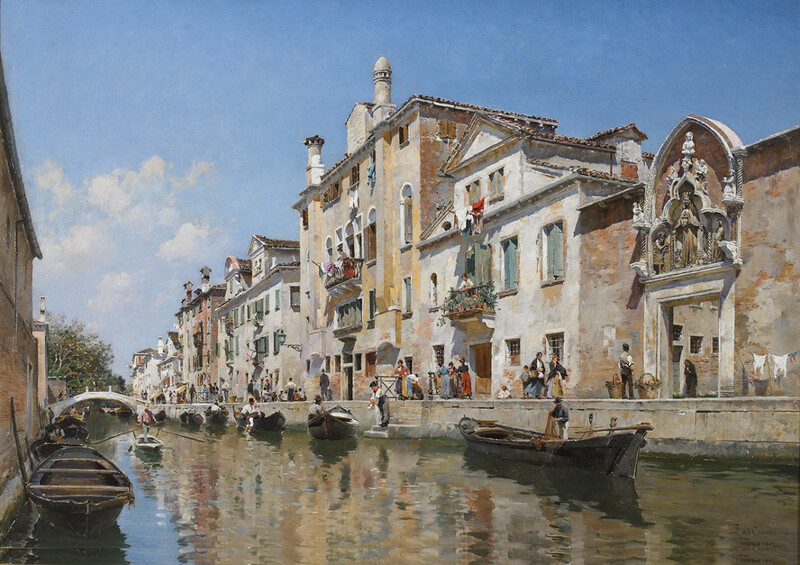 After receiving his artistic training in Madrid, del Campo travelled throughout Italy, finally settling in Venice in the 1880s. There he found a group of Spanish artists and began a friendship with Martin Rico y Ortega. 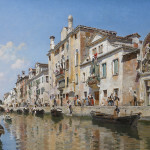 The two painters would become the primary recorders of vedute, or views of Venice, continuing in the tradition set a century earlier by Canaletto and Guardi. Venice had been an obligatory stop on the Grand Tour since the 18th century, however it was during the 19th century that it became a fashionable center for the rich and famous, who frequented such popular spots as the Caffè Florian or the Danieli Hotel. The desire to take a “souvenir” back home led to a strong tourist market for vedute and artists like Martin Rico and Federico del Campo were available to supply the visual “postcard.” The technical mastery always evident in their work had its origins in their earlier Academic training. However, both Rico and del Campo were also interested in exploring the impressionistic effects of light, and therefore preferred to work outdoors directly from nature. Venice provided the perfect subject to combine these two stylistic approaches. 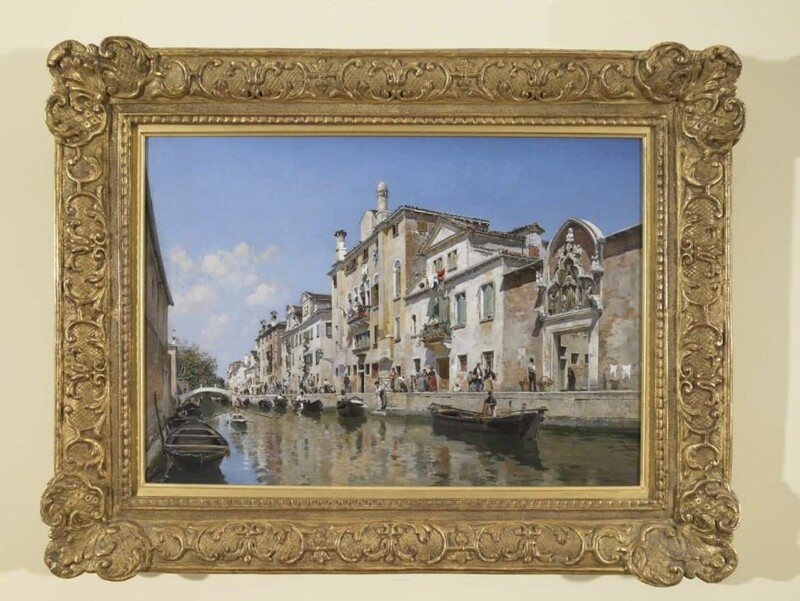 Our painting shows a scene bustling with daily activity set along a Venetian canal. The stucco buildings are awash in soft Venetian light set against a blue sky, while the sun casts shadows on the facades of the buildings and luminous reflections in the water. A beautiful feature in the composition is the sacred decoration of the building on the right, although it has not been possible to identify the sculpture of of the Madonna Della Carità above the portal. Del Campo likely drew his inspiration from his travels through the streets and canals of the city. 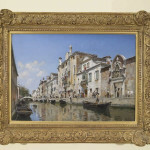 His paintings succeeded in capturing the essence of Venice, which was timeless in the 19th century and remains so today.